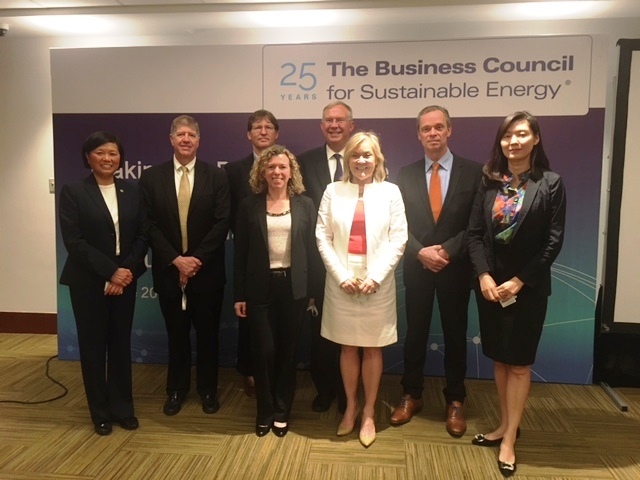 The Business Council for Sustainable Energy (BCSE) hosted a side event on “Making the Business Case for Investing in Energy Efficiency, Management and Productivity” on June 6 at the 8th Clean Energy Ministerial in Beijing, China. The Clean Energy Ministerial is an action-oriented and important annual gathering of the energy ministers from the 24 member countries. This private-sector focused side event featured multi-national companies that are leaders in providing the technologies, systems and solutions that manage energy production, use and storage in all sectors of our economies – from industry to transportation to the built environment. The panel focused on making the business case for continued action to promote energy efficiency by both the public and private sector. 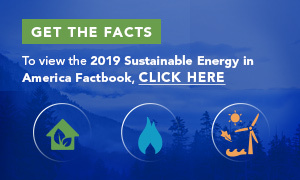 Driving these investments are economic factors – including energy and financial savings and improved energy productivity, as well as the environmental, climate and resilience co-benefits. From Left to Right, Back to Front: Nellie Cheng, USGBC; Mike Thompson, Ingersoll Rand; Bill Sisson, UTC; Lisa Jacobson, BCSE; Clay Nesler, Johnson Controls; Kateri Callahan, Alliance to Save Energy; Harry Verhaar, Philips Lighting; Elizabeth Pei, Schneider Electric. Lisa Jacobson, BCSE President set the scene, highlighting the importance of economics, internal and external goal setting and public-private partnerships as drivers of action for investment in energy efficiency. She also shared how the energy sector in the United States is rapidly shifting towards cleaner, more efficient sources by highlighting top-line findings from the 2017 Sustainable Energy in America Factbook, produced in partnership by the BCSE and Bloomberg New Energy Finance. Kateri Callahan, President of the Alliance to Save Energy, explained how focusing on improving energy productivity (EPO can help countries meet the emissions targets of nationally determined contributions (NDCs) and how companies are also participating in voluntary initiatives such as EP100. Clay Nesler, Vice President, Global Sustainability and Industry Initiatives, Johnson Controls, spoke to the value of international collaborations, including corporate energy productivity programs and campaigns such as the U.S. Department of Energy’s Better Plants Challenge and EP100; sub-national building efficiency improvements and public-private partnerships such as the SEforALL Building Efficiency Accelerator; and multi-lateral building efficiency research collaboration such as the U.S.-China Clean Energy Research Center (CERC)’s Building Energy Efficiency Consortium BEE). Bill Sisson, Senior Director, Sustainability, UTRC, United Technologies Corporation, spoke to how increasing building efficiencies can help national governments to address their NDCs, while also yielding additional co-benefits such as jobs and cleaner air, as well as opportunities for the private sector to offer efficiency technologies, services and solutions. He highlighted the World Business Council for Sustainable Development Amplify initiative where the private sector engages local markets, provide support and increase awareness, address capacity shortfalls, develop innovative incentive and financing schemes and pursue effective policy mechanisms for building efficiency. Mike Thompson, Global Director, Refrigerant Applications, Ingersoll Rand, provided an update on the company’s commitment to the CEM’s Advanced Cooling (AC) Challenge. Through the company’s own climate commitment, Ingersoll Rand is positioning itself as a global technology leader in the heating, ventilation and air conditioning (HVAC) industry by being on the forefront of environmentally sustainable products and offerings. Harry Verhaar, Head of Global Public & Government Affairs, Philips Lighting, spoke to the role of the energy efficiency and connected LED Lighting in improving energy productivity. New and innovative business models have a key role to play in accelerating the rate of energy productivity improvement. Philips Lighting is a leader in the CEM’s Global Lighting Challenge and is taking its own corporate journey towards carbon neutrality by 2020. Nellie Cheng, Managing Director, China, US Green Building Council (USGBC), made the business case for green buildings by emphasizing their economic, environmental and social impact co-benefits. She noted the value of systems such as LEED and Energy Star for building efficiency, and how Arc, a new platform recently launched by USGBC, provides a building performance monitoring and scoring platform. Elizabeth Pei, Director, Corporate Affairs, Schneider Electric China, introduced EcoStruxture, a Schneider campaign that provides solutions in a world that is more decarbonized, more digital and more decentralized. In this new energy world, energy efficiency gains will be realized through the convergence of information technology (IT) and operational technology (OT). Download the BCSE CEM8 Side Event Presentation.